An umbrella or sunshade is a great advantage when painting outdoors, as it keeps the sun from shining on your palette and working surface, distorting the colors and values. It can be difficult to set up in the wild, however. 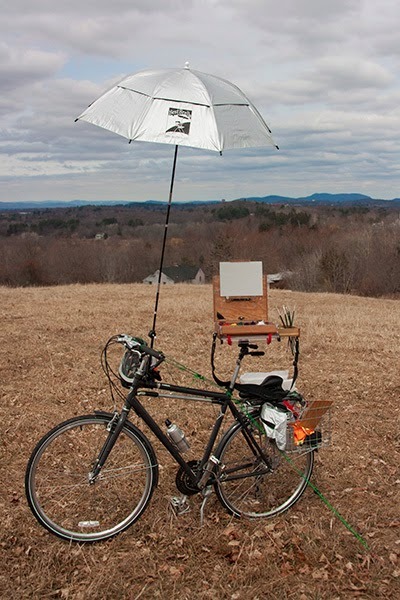 Some umbrellas are made to stick in the ground, some to clamp on to the tripod or easel, or come with attachments to do either. I had a little brainstorm last March about using the front wheel of my bike as a mounting point, as it would afford two axes of rotation: the wheel itself and the handlebars. I secured it to the wheel with Velcro cable ties, and used another cable tie to hold the front brake lever closed, setting the angle on the hub axis. I made a pair of reins to hold the handlebars in position, and experimented with various ways of securing them. 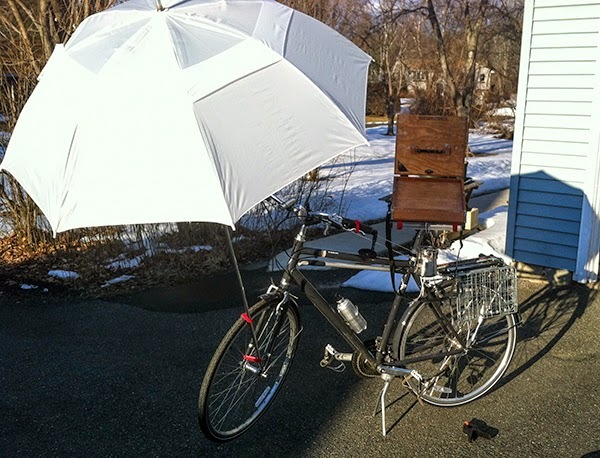 Once I got the thing rigged up, it reminded me of the famous Surrealist motto, "A chance encounter between an umbrella and a sewing machine on a dissecting table." I decided to name my invention in honor of Isidore-Lucien Ducasse, the original author of the phrase. Testing with the pochade box attached. The sun is low; you can see how the box is in shade and the shadow of the umbrella on the wall behind. It was pretty easy to adjust the wheel and handle bars to shade the box area. The next day I tried it with the addition of guy ropes to stabilize the bike. I also used a higher quality umbrella (BestBrella). Instead of clamp or slipknots to hold the reins, I used the same nifty quick-release fittings (Nite Ize) as the guy ropes. Unfortunately, when the sun is higher in the sky the angles don't work out so well. 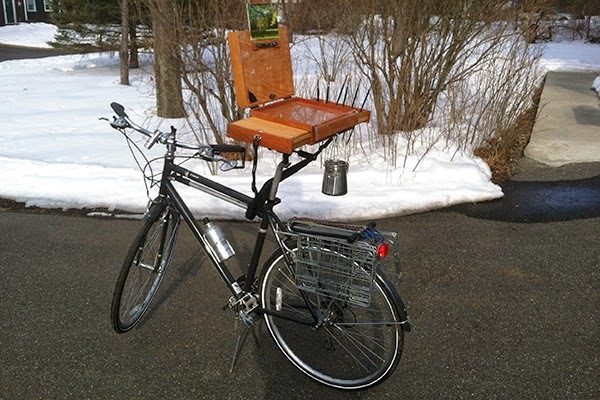 I couldn't find a good setting for the wheel and handlebar to shade the box. 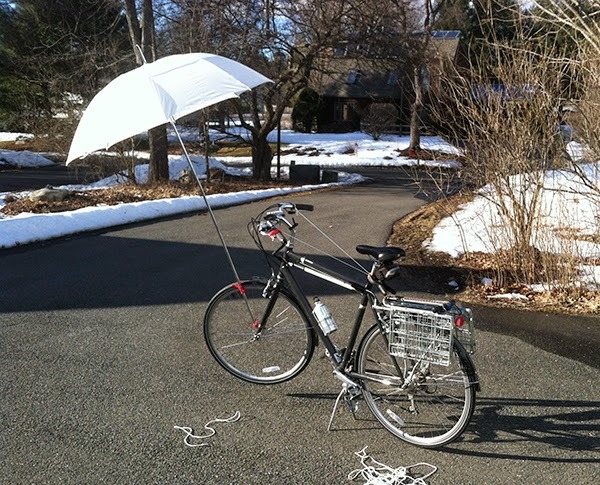 However, the umbrella could clamp onto the bike almost anywhere, sticking out at almost any angle, and the guy ropes would stop the bike from being pulled over. So, it turned out that the guy ropes were the most useful thing to come out of this exercise. 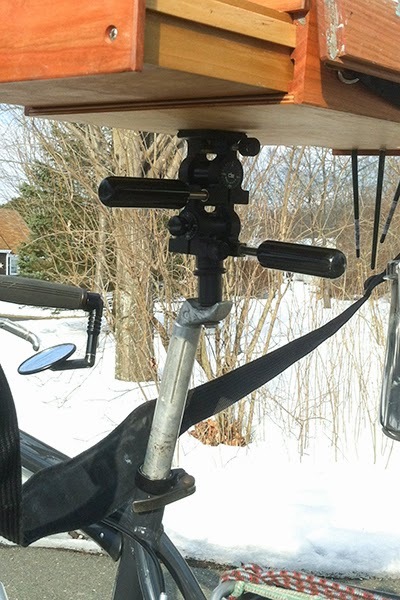 I haven't used used the wheel and handlebar setup since, because the BestBrella's heavy duty clamp combined with the guy ropes' stabilization covers most situations. Below is the setup I use now. The guy lines are very useful in windy conditions or when the ground is soft. 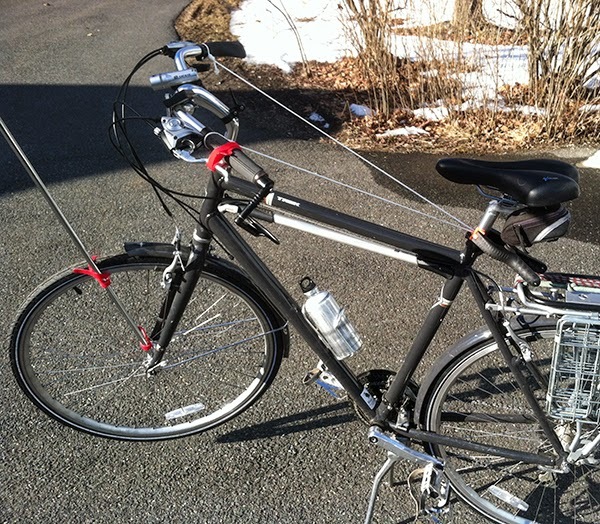 The reins are not usually needed because the umbrella is not attached to the wheel or handlebars. I'm still glad I tried out the wheel idea, if only for that first photo. 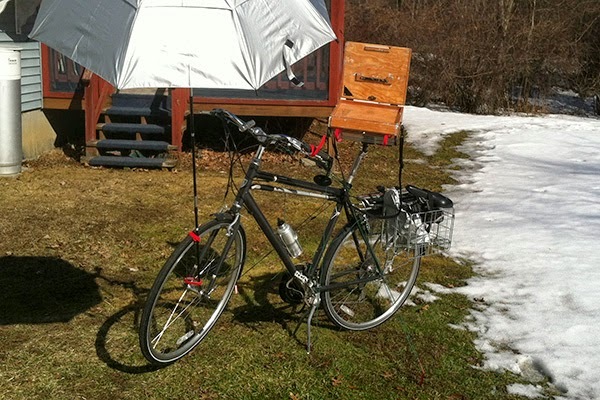 I fitted out my bike to act as a tripod for the pochade box, using the head from an old tripod. I got a used seat post and bolted the head to it. 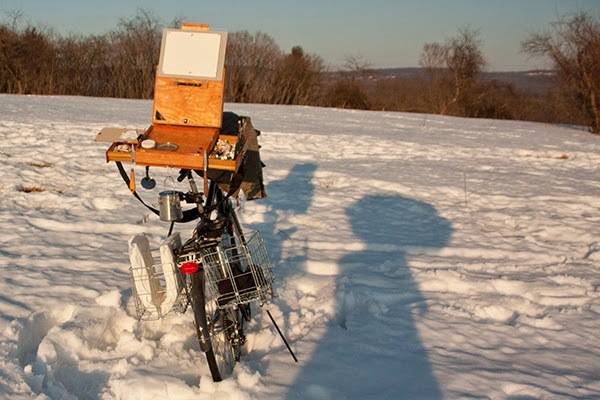 I rode it up to Mt Pollux to test both the tripod mount and the format adapter under real world conditions. The mount worked perfectly, and was easy and quick to set up. The bike itself started to sink into the snow and list to port after a while, but I was able to compensate by adjusting the pan head axes. You can see my shadow on the right, showing the umbrella I have attached to my body to shade the canvas and palette. What do people do to get to know new colors? I used to simply have at it and see what happened, but in recent years I have gotten a bit more methodical. Inspired by such works as Richard Schmid's Alla Prima and James Gurney's Color and Light I would try to make neat and orderly grids of carefully calibrated tints and shades. I found it tedious and difficult to get the colors to stay inside perfect squares, so it wasn't long before I let the production values slack. 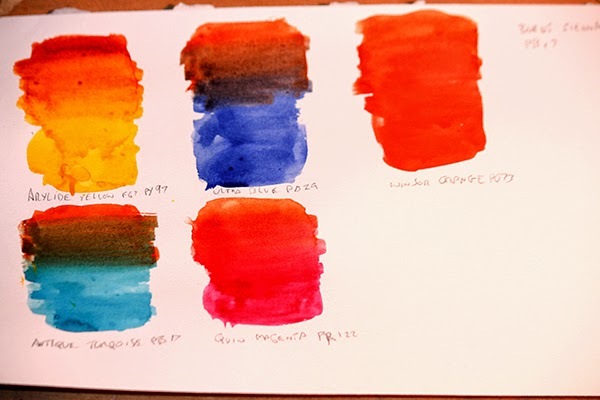 I still try to put the colors through their paces, seeing how they lighten in a wash or darken when mixed with complements or near complements. 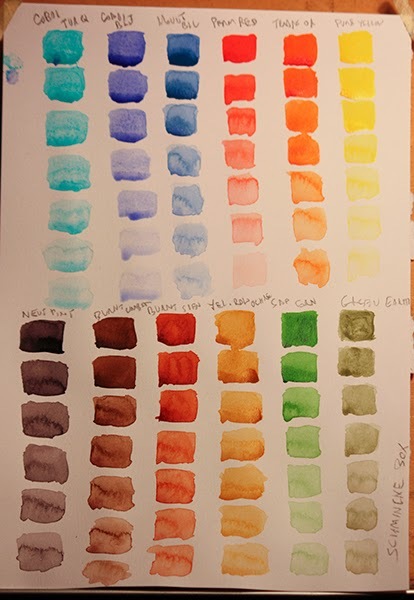 The colors are the ones I eventually decided to include in my new Schminke watercolor box. Some were new Schminkes, some old favorites, and some rediscovered because they seemed to go with the Schminkes. 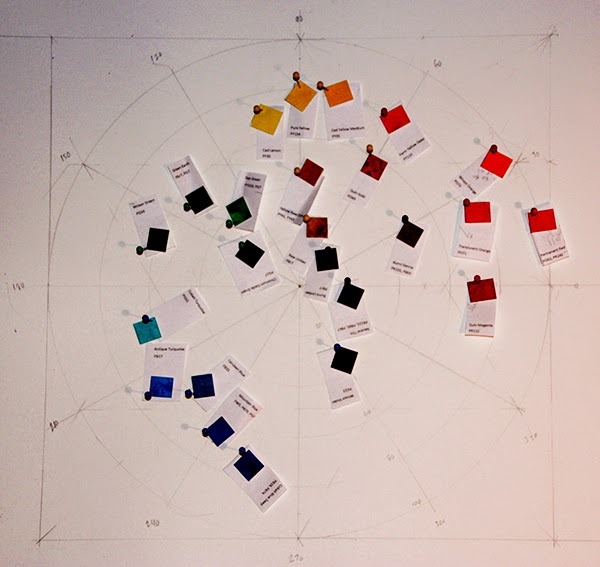 The design is based on Gurney's simplified color wheel with pigments which was in turned based on MacEvoy's more complex one. I traced out the circles with a compass. The radiating lines divide the circumference into 30˚sements, like a clock face, and mark off the theoretical hue positions of Yellow at 12 o'clock, Magenta at 4:00 and Cyan at 8:00, for the subtractive primaries, and Red, Blue and Green, the additive or light mixing colors at 2:00, 6:00 and 10:00, with intermediate gradations in between. The concentric circles represent levels of saturation or intensity, so colors closer to the center are increasingly grey or brownish. 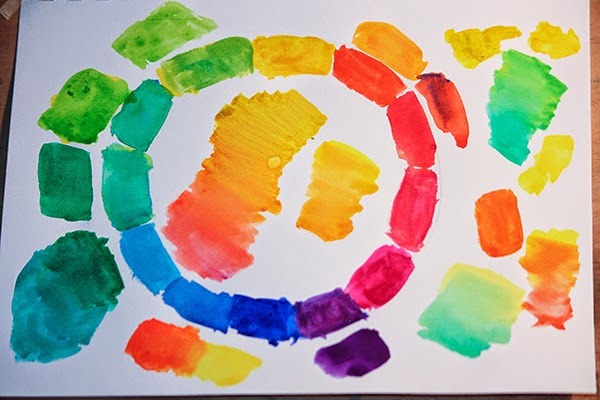 Instead of painting the pigments directly onto the wheel, I brushed them out onto watercolor paper and cut the paper into 1/2" squares to make color chips. 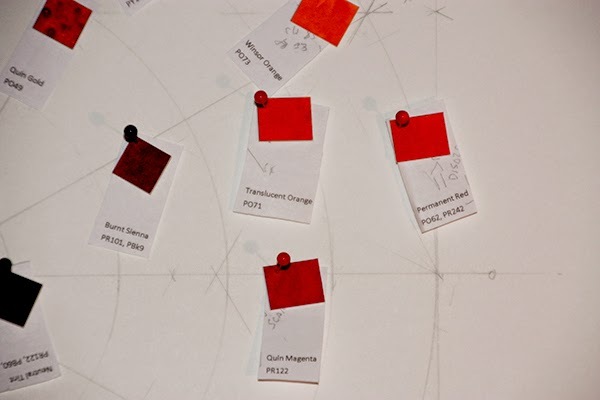 I then printed out the color names and made labels, and affixed each chip and label to the wheel with a pin. The idea is to see how your actual pigments map onto a theoretical color space. I think my two examples contained elements of the CIELab and YRMBY hue circles and the Munsell scale of intensity. For my purposes, any consistent and easy to interpret system was good. I started by following the layout in Gurney's and MacEvoy's examples, and tried to fine tune the positions for my particular pigments. It was interesting to note, for instance, that Quin Magenta, which I think of as my "true" magenta for mixing purposes, is actually in between true magenta and red on the wheel. It's also interesting to see how yellows and reds have more degrees of saturation and max out near the circumference at bright values, while blues and violets max out near the center and dark. I'm just getting into this, but is seems like a useful exercise. The question of placing the horizon involves several factors. 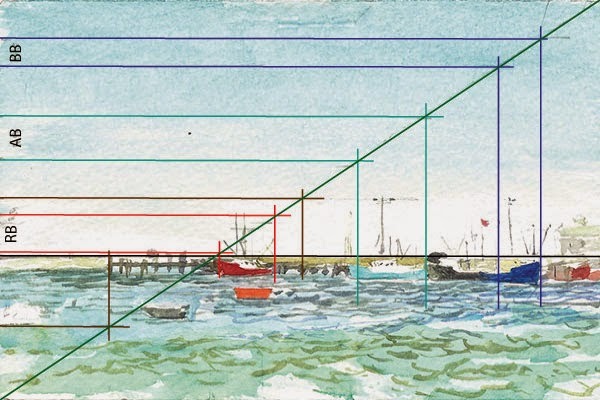 In this context, "the Horizon" doesn't necessarily mean the line between Earth (or Sea) and Sky (in many scenes this is not even visible); but an abstract reference line representing your eye level. Whenever you are observing any scene, this implied horizon is present; it's an attribute of you as the observer. If your eye level is high, the horizon is high, if your eye level is low, the horizon is low. As a general rule, this equates to larger or smaller proportions of ground plane to sky, respectively. For purposes of simplicity, we'll confine ourselves for now to describing situations where we are looking straight ahead, parallel to the ground plane, with our heads on straight, not tilted or lying on one side. In these situations, the horizon can be considered to be a straight horizontal line. The horizon line will be in the center of our field of view. Objects below our eye level will show their top planes; we are looking down on them. This is true no matter how far away they are. Objects above our eye level will show their bottom planes, again regardless of how far away they are. Planes exactly at eye level are not visible - only their edges are presented to the eye, in line with the horizon, regardless of distance. The aspect of distance needs to be emphasized because objects will also appear smaller with distance, which can lead to confusion about whether we are actually above of below them. For instance, a distant building will seem so small relative to a near one that you might be tempted to believe you can look down on it - but if its roof is above the horizon line, it's still above your eye level. These points all relate to the horizon's presence in any observation of a scene; the horizon line also has a part to play in constructing a picture. A picture doesn't usually try to encompass one's entire field of view; it's a rectangle (let's stick with rectangular formats for the sake of simplicity) cropped out of the larger scene with its proportions and placement chosen for reasons of utility or artistic expression. The horizon line may appear at any position in this rectangle, dividing it up into whatever proportions the artist chooses. For that matter, it may not appear in the rectangle at all, but still play a role as an implied reference. Since we are limiting the discussion as stated above, it will be a straight horizontal line at right angles to the rectangle's sides. 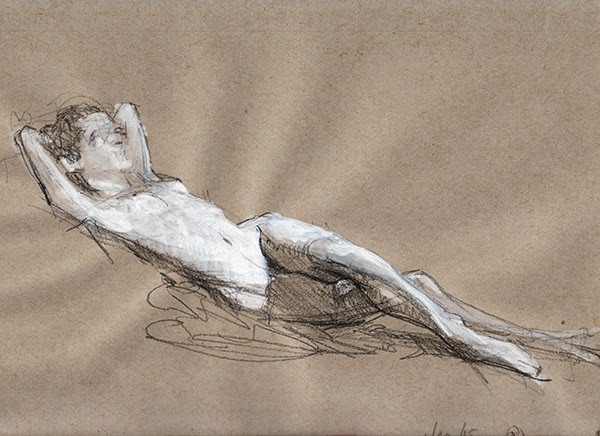 As an artist, how do you choose where to locate the horizon line when setting up a picture? A major consideration is usually what you want to include. If you are viewing a seascape from a moderate height you have the option of emphasizing either one or the other or both equally. If you wanted to devote most of your painting to the sky, you would select a rectangle such that the horizon line was placed near the bottom. This will not change your relationship to the horizon as observer, and a rock that is below your eye level will still show its top plane; it simply means that you have chosen to crop out a lot of the lower part of your field of view. Another consideration is the design of the picture itself. The horizontal division can be a very powerful factor in the overall design, and we are often warned against putting it in the middle, because that would be boring, or cut the picture in half. That's a good rule of thumb, but you are the final arbiter - you can put it wherever you think the design needs it. This has been a lot of verbiage just get a horizontal line across a sheet of paper. Once you have it, what is it good for? The horizon, along with the rectangular bounds of the picture, provides the basic reference against which we measure all the other elements. Every element will be some distance above or below it and oriented at some angle relative to it. This is an area where confusion can creep in, because we use the horizon as reference for both the 2d layout of the picture and the construction of the illusion of depth with linear perspective. It's important to keep track of which you are doing when. 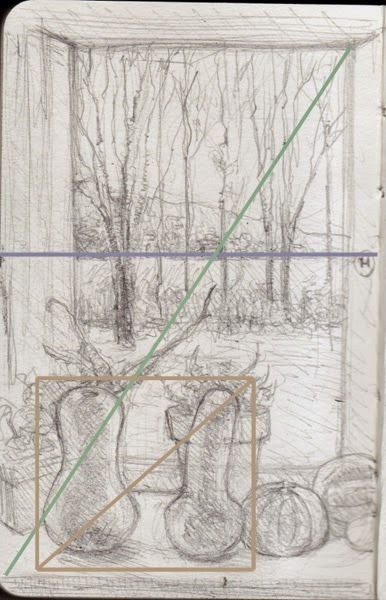 When sketching from a scene, we typically start with the 2d layout, measuring ("sighting" in Betty Edwards' terms) the size, placement and angles of the scene's elements. Edwards, in Drawing On the Right Side of the Brain offers this process: First, identify some easily measured element in the scene, such as a door frame top, then measure with your thumb on the pencil, call that distance your "Basic Unit," then calculate the lengths of other elements using that unit; the door frame side might be 2 and 2/3 Basic Units, in her example. You then have to translate that ratio to whatever scale your drawing is. Frankly, this seems incredibly tedious and error prone to me. No way my big fat finger is going to accurately mark off 2/3 of a distant door top on the side of pencil. All that converting into numbers and back into shapes - way too left brained (which she admits). However, the very next paragraph, she is on to measuring angles, using the pencil to gauge them relative to the horizontal and vertical lines, and visualizing the triangles they make as aids to memory when transferring them to paper. WHY NOT JUST USE ANGLES FOR EVERYTHING? When measuring, we are concerned not with absolute quantities, but with ratios. Ratios can be expressed with slopes (angles)! Any shape or collection of shapes can be imagined as bounded by a rectangle, and the proportions of the rectangle are given by its diagonal. 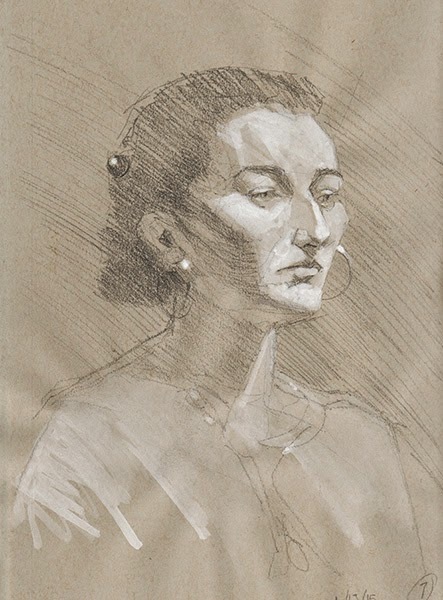 Given a rectangle of a given format and a horizon line of a chosen position, start by simply measuring the diagonals of the whole picture and of the upper and lower sections. Use the diagonals to find the center points and horizontal and vertical center lines. Mark or memorize these. Then find the largest element and visualize a bounding rectangle enclosing its widest and highest points, estimate its location relative to the larger rectangles, measure its diagonal to establish its proportions, and move on the next largest element. After a while, the layout will be well enough established that you can proceed more intuitively, without having to do so much measuring but confident that you are not going significantly awry. Here's a little sketch I did to test out this idea. 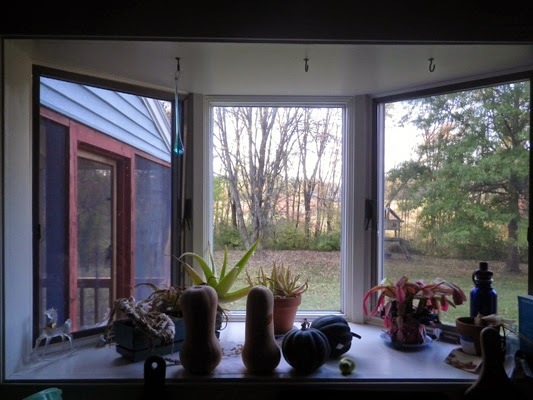 It's out of a bay window, with some squashes and aloe plants on the shelf in the foreground, then the window through which is seen a patch of back yard, a maple, a line of trees and underbrush, a small ravine with a field sloping up behind it, some more trees and buildings, and a small mountain range in the distance. 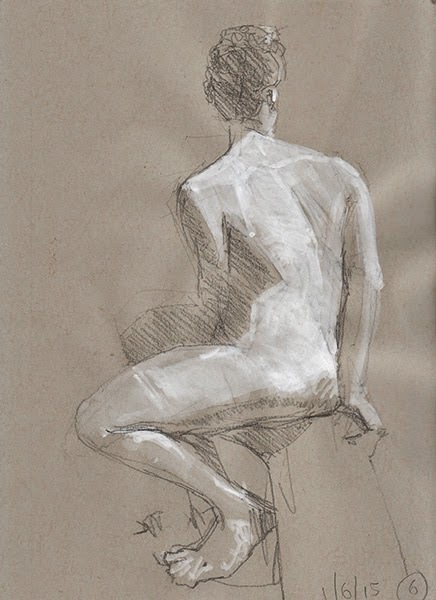 The range of distances and sizes of objects make this a challenging subject, although the window provides a nice rectangular reference for free. This photo more or less encompasses my actual field of view. The area I chose for the picture is miniscule in context. 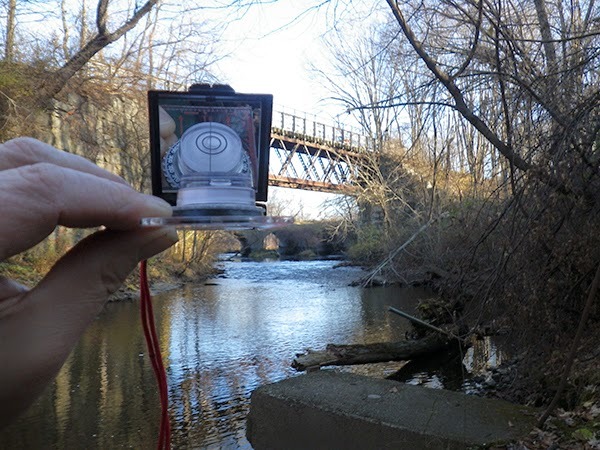 In order to figure out where my eye level was relative to the scene, I used a few different strategies. First was to make sure I was looking straight ahead and then estimating the center of my field of view. I visually extended the orthogonals of the porch on the left to see where they crossed, and noticed that they converged on a house across the field. It seemed reasonable to assume that the first floor window of that house might be roughly on a level with mine, so I placed my observed horizon there, just above the far end of the field. I decided I wanted to include more space for the squashes on the shelf than for the bay window ceiling, so I set the picture's horizon high, about 3/5 of the way up. 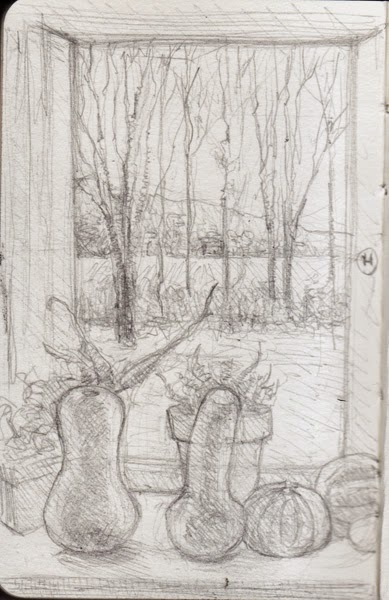 I next took a diagonal from corner to corner of the window and extended it down to bottom the page. This helped to place the near edge of the shelf, creating the space in which the squashes and plants would sit. I needed to establish the highest point that the aloe leaf reached, so I imagined a horizontal line at its tip, made a diagonal from its intersection with the window edge to the window bottom, and used that to find the point in the picture. I did a similar exercise to locate the far end of the back yard. The two standing squashes seemed to function as a single design element, so I imagined a bounding box for them, pulled the diagonal, and transferred the proportions to the picture. I could see that the left squash overlapped the window frame, and, because I knew where the center line of the window was, that the right one lined up with it. Given this width and the measured diagonal, I could find the correct height for the pair, and then go in and draw them individually. That done, I could draw the other stuff freely, knowing the basic layout was correct. Well, actually I still screwed up in a couple places, losing track of which line was which, but with this methodical approach, it would be pretty easy to fix. I assembled a kit with measuring devices and have been playing around with them off and on. 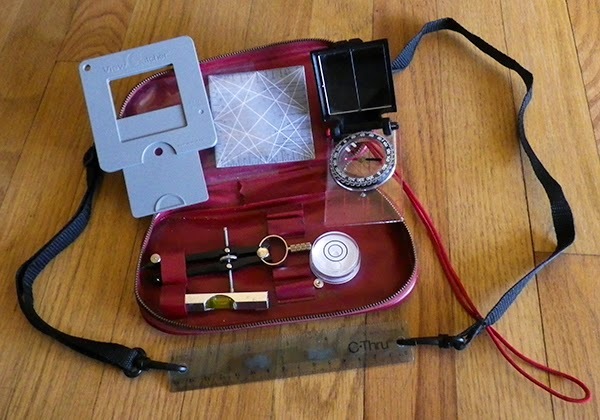 Clockwise from top left: ViewCatcher, Hor:ratio, mirror compass, bubble level, drafting compass, line level, reticuLanyard. 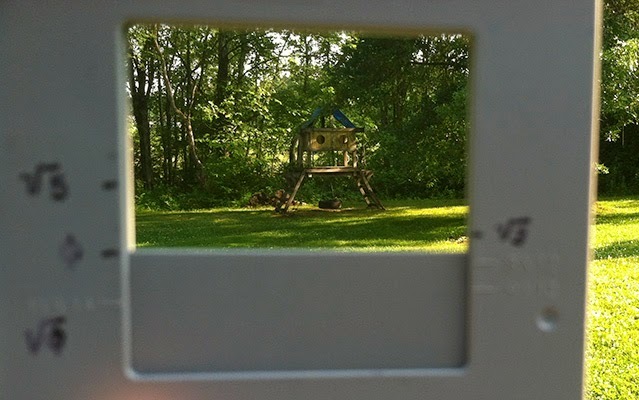 The ViewCatcher is a handy tool for framing a view out of a scene. It has presets for commonly used aspect ratios like 8" X 10",9" X 12" etc. I sometimes use it in conjunction with Hor:ratio to set it to specific proportions or to search for interesting proportional relationships in a framing determined by the subject matter. The idea is to be able to be able to find your own eye level and relate it to a point or points in the scene. Use the mirror to view the bubble level, and raise the whole contraption until the bottom of the compass base appears as a flat line, neither above nor below your central line of sight. Here it is at the scene of the truss bridge. Juggling the compass and bubble level while looking into the distance takes some getting used to, but it's definitely doable. Jugging the device and a camera to take a picture at the moment it all aligns was really a challenge. I didn't quite get it to flat line from the camera's point of view, but I hope you get the concept. When my eye was actually level with the device, the horizon line was located right about where the central pier of the distant bridge starts to curve into the archway. I find myself consistently surprised at how high my actual line of sight is when parallel to the ground. I must slouch around with downcast eyes a lot. Here you can see the horizon drawn in, along with square reference box, principal vanishing point and diagonal vanishing point lines, as seen in Perspective Hacks. The heavier dots up and down the vertical line are measuring points taken with the drafting compass, used as a divider or caliper to measure lengths and distances. 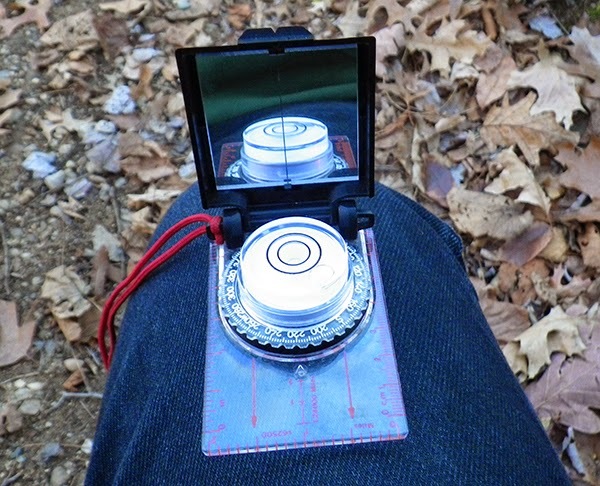 I use both the drafting compass and the line level as accessories to the ReticuLanyard, which is a made up name for the plastic ruler with an adjustable strap at the bottom of the photo. I threw it together based on this post by Rebecca, who also suggested the addition of a level. The notation at the bottom, 45:15, is the relationship between the sight size of my "basic unit," for which I used the distance from the principal vanishing point to the bottom of the picture, and the drawn size of the same unit. I wrote it that way instead of simply 3:1 because I used the 60th scale on Hor:ratio to be able to easily multiply or subdivide observed measurements. The combination of all of these devices and techniques really changes the way it feels to stand in an environment and try to come to grips with how to draw it. I don't think it's always appropriate to work this way; I still like to simply plunge in and see what happens when I eyeball it, but I think it's a good experience to calibrate your perceptual relationship to the space around you this way. As with my other experiments with the dresser and climbing structure, I found that doing these careful measurements of the truss bridge revealed just what a rickety, out of true and fundamentally non-Euclidean structure it is. I'll think twice about riding my bike over it now. On our recent vacation I came up with some attempted solutions to measuring apparent sizes and distances and transferring them to the art surface at a different scale. In my experience, this is somewhat confusing to do, and horrendously confusing to explain in words! I will try to get it across as clearly as I can. 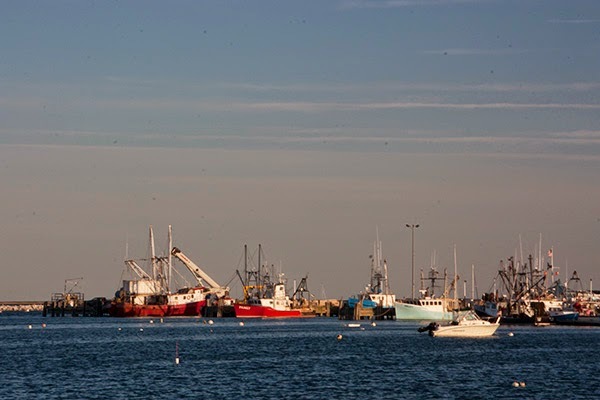 The first thing I noticed when we got to our rental in Provincetown was the amazing afternoon light on the intricately detailed panorama of boats, buoys, and docks of MacMillan Pier across the water. I took this photo at the time. 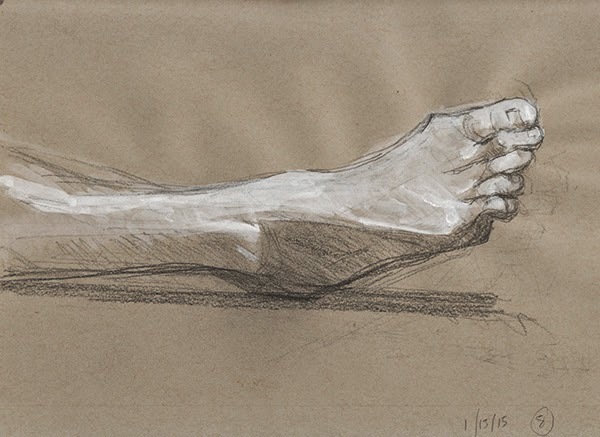 When I went to paint it from life a day or so later, I realized it posed some problems. I decided to frame a small portion of the scene, including the two red boats on the left, but they were far away and their apparent size was very small. I wanted to get a sense of the intricate tracery of masts, ropes, and piers in my small sketch, so I would have to enlarge it on the paper to be at all doable. I usually paint simpler scenes by eyeballing and adjusting as I go, and complex scenes by measuring and painting at sight size. In this case, sight size was too small; I would have to scale it up. 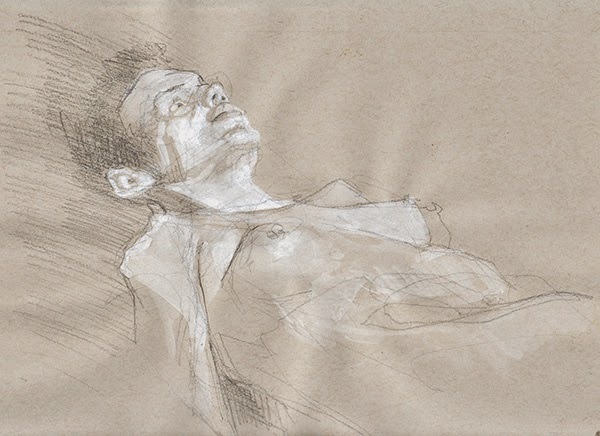 I sometimes use the traditional thumb on pencil technique to measure and resize, but I've never really liked that too much, because my thumb is imprecise and it requires too much left brainy translation of visual measurements to numerical proportions and back again. 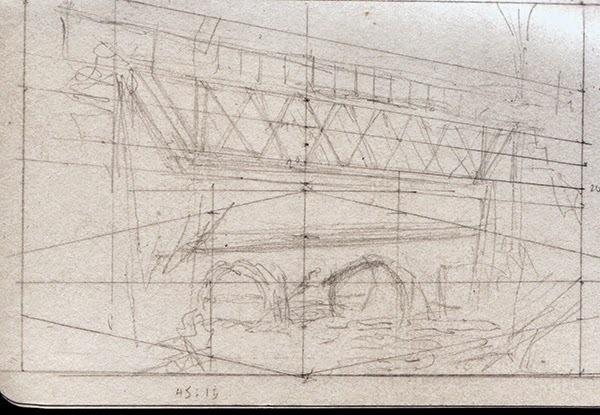 My next thought was to adapt the same proportional conversion method I used for doing perspective without vanishing points to measure and plot the key landmarks and salient features onto my sketch. For that, I used a separate piece of paper or card stock to mark off distances on one side and a diagonal line from a corner to map points onto the adjacent side. The angle of the diagonal determined the proportional distance of the point from the corner, which I used to place points in perspective on the picture plane without need of vanishing points. In this case, the same idea could be applied to scaling the sight size to the re-scaled or projected size according to a constant proportion. 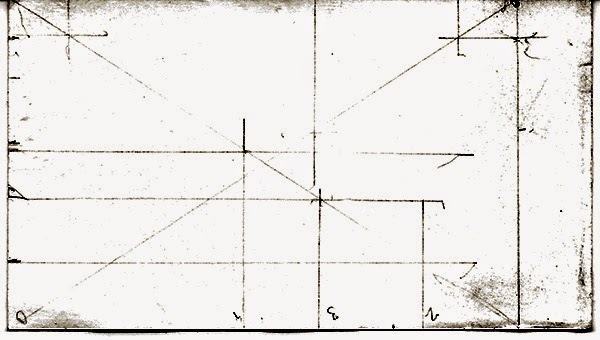 I would use the short side to measure the sight size and the long side to record the projected size, then transfer it to the paper. One vital factor is that the measuring tool be kept at a constant distance from the eye. Fortunately I have the reticuLanyard to help with this. The eye-tool distance can be controlled by adjusting the lanyard, so I could hold up the short side of the card and make its apparent width equal the desired width of the finished picture, based on the composition I had selected using a ViewCatcher. I interposed the ViewCatcher between my eye and the extended reticuLanyard to establish this dimension. 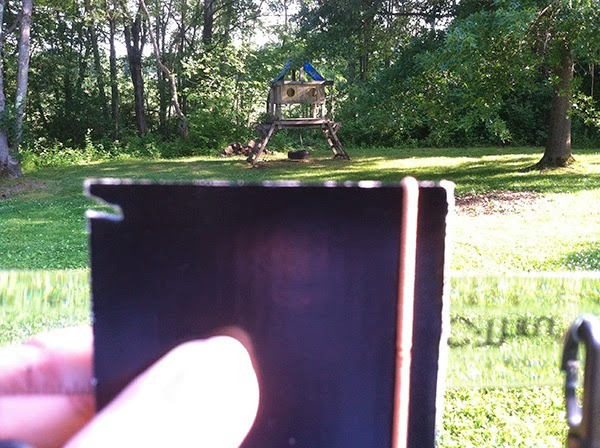 I used the back of a business card as my measuring tool. As the number of tick marks and lines increased it became confusing, so I assigned numbers to the more significant measurements. I tried two other ways to apply this idea. One was to make the marks and do the conversions directly on the art work, and the other was to construct a device with adjustable gauges so you wouldn't have to make marks on it. Here's the one with the marks on the paper, with an overlay to make it more clear. You can see that I didn't faithfully adhere to the original measurements - this because either the boats moved or the light changed, revealing details I'd missed at first. I'm not interested in photorealism, but I was glad to get a higher level of accuracy than I would have with thumb and pencil. 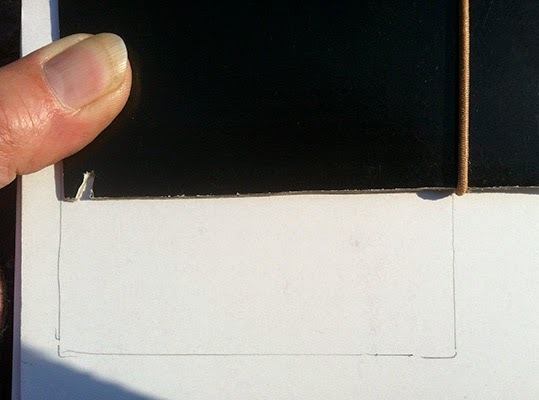 The watercolor paper is a 4" X 6" postcard, so it was small enough to hold the short side up to measure sight sizes. 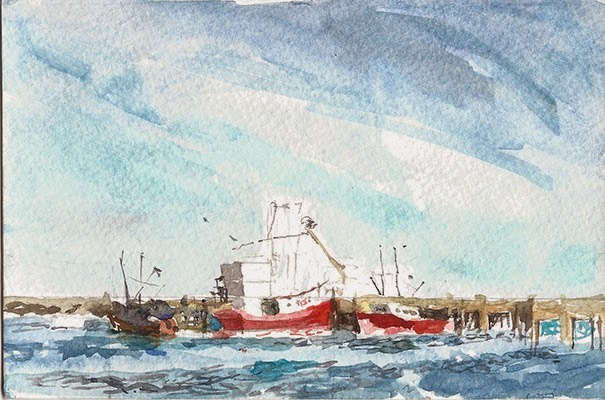 I labeled them "RB" (red boat), "BB" (blue boat), etc. I then located the points on the long side. I could use the same scale for the vertical measurements as well; I just had to remember to scale them on the long side, then take that distance and transfer it back to the short side. The brown line for the height of the highest light pole is an example. This all sounds very involved, and it does take a bit of doing to get it all set up. However, you only need to establish a few salient points - once you have those, you can judge sizes relative to marks you already have on the paper. 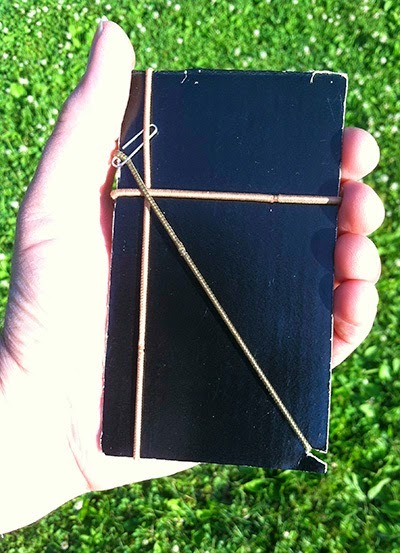 The other idea I tried was to use rubber bands or hair ties on a piece of cardboard as moveable markers. This would reduce the number of confusing pencil lines and be more reusable. 1. Set up composition and framing. Here, I'm using a ViewCatcher. I added some presets for other formats, in this case the "golden rectangle" indicated by the Greek letter phi. 2. 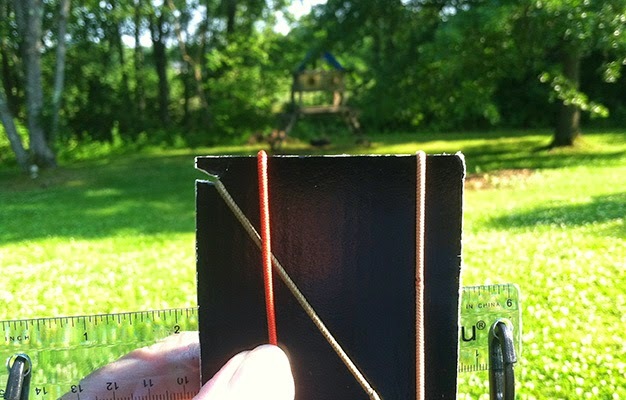 Using reticuLanyard to set the eye-measuring tool distance, mark the sight size of the long side of the frame with a rubber band or hair tie. It helps to use different colors for different functions. The left side, with the notch, is always the zero point. 3. With a second hair tie perpendicular to the first, mark the length of the long side of the art surface (or "canvas"). 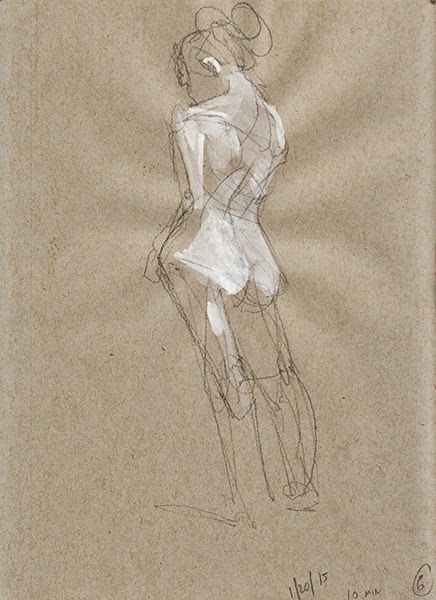 In this case I drew a golden rectangle frame on a sketchbook page. 4. Hook a hair tie in the notch and stretch it to intersect the corner made by the first two. Secure it with a paperclip or similar. Actually, the paperclip wasn't quite secure enough, so I think I'll go with a small binder clip. This is the diagonal or slope line. 5. Take a sight size reading - I'm measuring from the zero point to the left leg of the climbing structure - and mark with another hair tie (red). It will intersect the slope. 6. 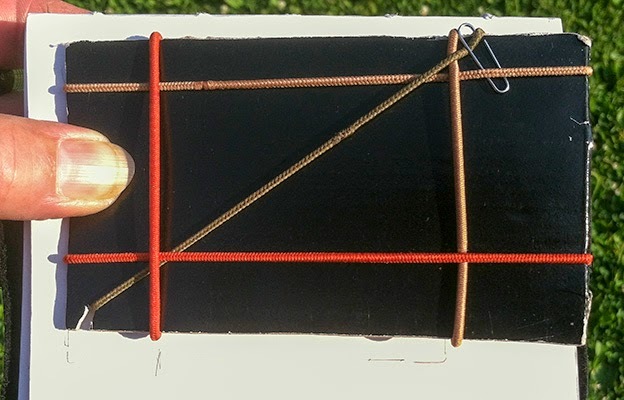 Use another hair tie to cross the intersection of the sight size line with the slope. 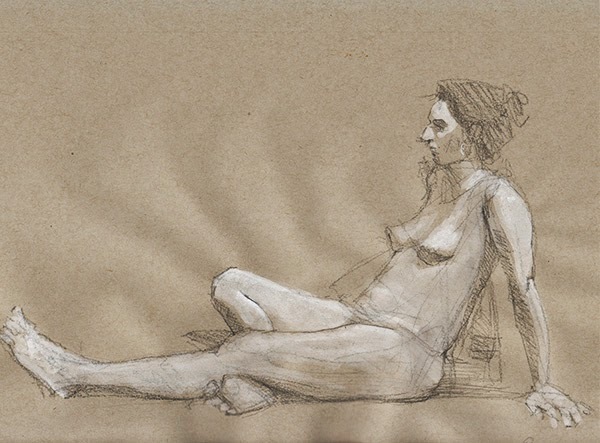 Its intersection with the long side gives the relative horizontal position of the left leg on the canvas. Mark its position on the paper.